Physic scams are aimed to mislead you in order to take your money. Generally, such scams offer you help in lieu of a fee. How to identify fake psychics? Psychic frauds contact you through telephone, email, post or sometime face to face to suggest you a positive future event. They also claim that you would be in a sort of problem and offer a solution. The solution, a fake psychic offers, can be a winning lottery number, a good fortune, or removal of jinx or curse. In case you do not want to pay, many fake psychics threaten about invoking a bad luck charm or curse on you. Psychic frauds may try to convince you to buy a wealth secret or lucky charm. Once you make payment, they send a valueless article or nothing. On the other hand, they warn you about a bad upcoming event and offer you protection from it, as a return of your payment. 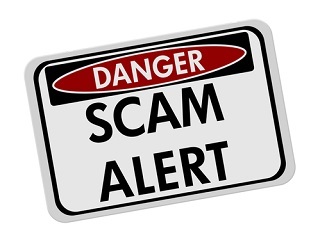 Scammers may attempt to persuade you about genuineness of their insight by intimating something about yourself that you earlier told or they collected from some other source like your personal information, available on social networks. Quickly run a google search about your name to check what kind of information is already existed that relate to you. Scammers offer you a free of cost personalized readings in return of your personal information. Thereafter, they request you to pay for further reading by attracting you with different means. 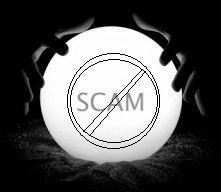 Psychic scams may inform you that you have been jinxed or cursed. Hence, you need to get rid of it immediately. Next, they suggest you the only method of releasing the jinx i.e. payment to them to carry out a session or more to have in depth reading for you. How to avoid Psychic frauds? If some scam approaches you with a claim that there is a danger for you including curse, jinx, or bad luck, you need to be very careful. It is most likely his claims lead you to a fraud. You should not send any sort of details about yourself, credit card or any money to such scammers and do not email him in any situation. If you respond him, it would show that you are keen to get more information. In that case, you would receive a series of emails and possible scam letters in future. Ultimately, you would be drag into scam. If you wish to hire the services of a psychic, it is imperative that you must make it sure how much cost would involve in exchange of an order you place on a psychic and what would be reward of that money. Further, you need to check any kind of conditions or some sort of hidden costs afterwards. You should not make telephone call, when you find it in a scam email. It is quite important for you to perform a google search, prior to any purchasing. The search terms like psychic name or company, complaint, scam, and review etc. would surely help you to avoid a psychic scam. In case others underwent bad experiences or scammed through the provider, you would generally discover it quickly with the help of immediate google search. You need to read the terms and conditions constantly and it would be better to get a fine print. Check whether your credit card is likely to be charged continuously, or if there exist any kind of hidden conditions linked with the purchase you are going to make. It is necessary to take help from your common sense. If it seems quite sound to you or true, it might be the genuine. You need to save your personal details. You need to use save payment processor services or websites. Do not make payment or handover credit card or your online account information to a stranger or someone you do not trust or know. Do not contact a telephone number, which you receive through a spam email and do not try to reply that email. Try a free psychic chat reading now with authentic advisors.